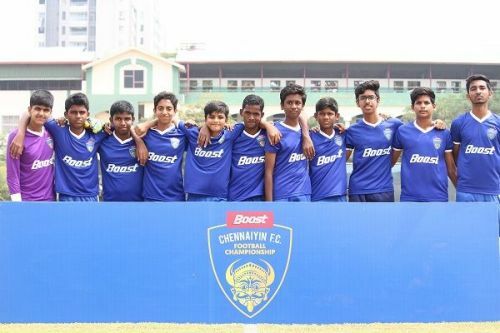 The inaugural 64-team BOOST-Chennaiyin FC Football Championship kicked off at the Doveton School Ground in Chennai on Tuesday, with teams from Madras Christian College Higher Secondary School registering wins in both U-13 and U-15 age groups. CFC U-15 striker P Tejeshwar, who scored four goals last season for the CFC U-13s, featured for Bhavan's Rajaji Vidyashram in their 1-0 over Wesley Higher Secondary School. The tournament will see more than 1,100 kids participate, with top three teams from both age groups receiving special coaching sessions with the CFC coaching staff and select first-team players. And after Sir Mutha School received a walkover from St. Ann's Matriculation in the U-13 category, Bhavan's Rajaji Vidyashram won 1-0 against Wesley Higher Secondary School. Bhavan's attack was led by CFC U-15 star P Tejeshwar. MCC Higher Secondary School were impressive in both age categories, running out 3-0 winners in both ties - against the Agarwal Vidyalaya U-15s and Chinmaya Vidyalaya, Virugambakkam U-13s.